at St. Stephen's Anglican Church Hall in Chester on March 7th, 2011. 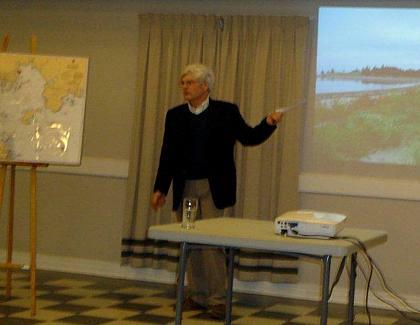 On Monday, March 7th MICA Director Syd Dumaresq made a well-attended informative presentation on island history at St. Stephens' Anglican Church Hall in Chester. His talk was on the founding of MICA vis a vis some of the other conservation organizations. He enlarged on the history of several islands and about the attitudes of the Chester community towards them. Syd's remarks were accompanied by a slide show, illustrating how the community became interested in the conservation, elaborating on wildlife on the islands, as well as traditional recreational uses of the islands. Syd pointed out that early on only two of all the islands were availalbe for public use. He traced the process of starting island acquisitions and the history of purchasing the MICA islands. 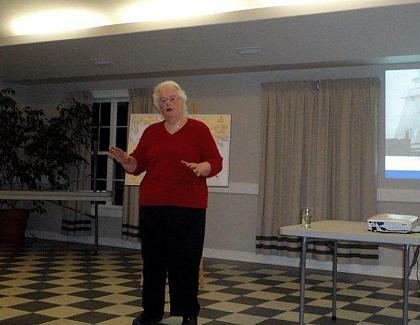 Gail Smith, a former Town Councillor who grew up in Chester, spoke about what public access to the islands meant to her and others in Chester during their childhood years - playing on the islands, fascinated by bird life, and learning island legends. She and her friends relished in the freedom to play in those island setting and she wishes the same freedom for present and future generations. on the Chester islands. March 7th, 2011. Syd closed the presentation by posing the question "What can we do to help?" A sincere thanks to Syd and Gail for a most informative evening.